Why is financing investment on the Investment & Human Rights Map? Businesses can either self-generate capital to make an investment, or they can seek money to fund their investment ventures externally. External access to capital is found in the capital markets in the form of equity (including through stock exchanges or private equity) or debt from private and public financial entities. Investment may be funded through complex financial packages that bring together a number of private and public financial entities, and that include guarantees and/or insurance from State-supported and private entities. These entities can be public, private or mixed and have a diversity of purposes. They also engage in a broad range of activities, from supporting traditional forms of foreign direct investment to complex trade transactions with an evolving array of products and services. How do these, often complex and multi-party, financial relationships, products and services relate to the impact of investments on people throughout the life of the investment venture? Are they a neutral force, a source of concern, or a positive leverage for change? According to the United Nations Guiding Principles on Business and Human Rights (‘UNGPs’) all business enterprises, including those providing financial products and services, have a responsibility to respect human rights. They further indicate that where there is a close nexus between State-supported financial services and cross-border business activities, there is a strong policy rationale to ensure that business enterprises respect human rights. A number of private and public financial institutions have developed standards recently that reflect concern for human rights. Perhaps the most well known is the International Finance Corporation’s Sustainability Framework. Other public financial institutions that support investment, such as the African and Asian Development Banks, have also developed lending criteria around social and environmental sustainability. 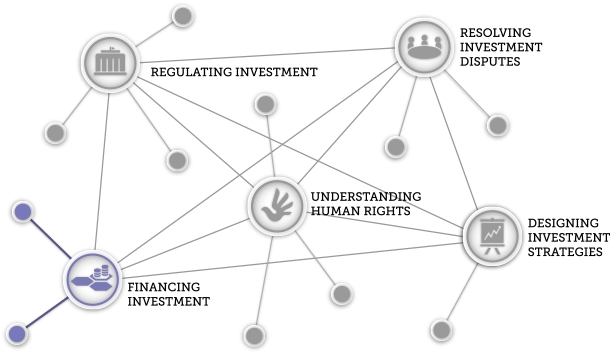 Further, a number of private and public financial institutions have committed to the Equator Principles, which require adherence with social and environmental policies, including human rights issues, in the provision of certain categories of investment finance services. According to the Equator Principles, 70% of international project finance debt is covered by the Principles. Some export credit agencies (‘ECAs’) have also begun to integrate social and environmental criteria, also related to human rights, in some of their financial services and products. For example, ECAs that belong to the Organisation of Economic Cooperation and Development (‘OECD’) have agreed to do so in what they call the ‘Common Approaches’. Some individual ECAs have put in place more stringent human rights, social and environmental requirements than what is agreed in the Common Approaches Recommendation of the Council on Common Approaches for Officially Supported Export Credits and Environmental and Social Due Diligence (the 'Common Approaches'), as adopted by the OECD Council on Thursday 28 June 2012 . Moreover, institutional investors have started to focus on human rights-related issues through environmental, social and governance criteria. Signatories to the UN Principles for Responsible Investment now manage more than $34 trillion in assets. Despite all of this activity, key questions remain regarding how to meaningfully embed concern for human rights in a critical mass of the financial support given to cross-border economic activity. One starting place for inquiry is to examine the ways in which the UNGPs may apply to the full range of highly varied financial entities, products and services. The OECD is undertaking work to map financial services that may progress thinking on this issue. The Hub’s work on ‘financing investment’ will seek to build understanding of how to meaningfully embed concern for human rights into the financing of investment including in the context of export credits, guarantees and insurance, investing and lending activities. There can be a number of connections between the financing arrangements for investments, policymaking and human rights. For example, export credit, guarantees and insurance agencies often operate in accordance with mandates from the home State, perhaps limiting their discretion regarding managing human rights issues. Further, certain terms commonly incorporated into investment contracts have been criticised on the basis that they restrict host States’ ability to pursue human rights obligations. These contractual terms have hitherto been justified by reference to the repayment requirements of banks. Financial arrangements connect in many ways with both the exit strategies of investors and the resolution of investment disputes. Insurance and financing arrangements can influence strategies pursued for resolving disagreements between the parties by, for example, by requiring or incentivising formal litigation rather than settlements. How can this connect with the protection of and respect for human rights in investment?